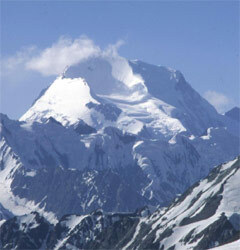 The Pamirs is not simply a range of mountains but it is a range of very high mountains. The highest top of the Pamirs reaches the altitude of 7499 meters above sea level, and the height of Ak-baytal pass located on Osh-Khorog road is 4655 meters above sea level. For comparison it should be noted that the highest point of mountainous area of Armenia, Aragats Mountain, is only 4090 meters high. Yet no one can climb up Aragats Mountain without preliminary training in mountaineering and without special mountain outfit, whereas through Ak-baytal Pass the motor road is laid. Ninety-three per cent of the territory of Tajikistan is occupied by mountains, so one might as well give geographical rather than administrative borders to the country. From the Pamirs, which means "Roof of the world", there ramify the highest mountain systems, including the Karakorum and the Himalayas in the south, the Hindukush in the west and the Tien Shan in the north-east. The frontiers separate Tajikistan from Afghanistan, Uzbekistan, Kyrgyzstan and China. Tajikistan is one of the most ancient states of the world. 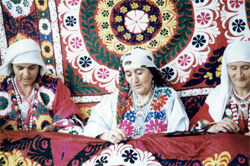 Its history is closely linked with the history of neighbouring countries of Central Asia. It is generally agreed by the scientists that in the middle of the second millennium B.C. semi-legendary Aryana, inhabited by the Aryans, was situated on the territory of modern Tajikistan. These territories used to form parts of ancient Sogdian and Bactrian empires. In the 6th century B.C. the country was conquered by Akhemenids. However, already two centuries later the Persian state fell under the strikes of Alexander the Great. And today, in high-mountainous Tajik villages one can meet blue-eyed and fair-haired inhabitants, who are the descendants of Macedonian warriors. The Graeco-Bactrian empire, which arose on the fragments of Alexander's empire, was conquered by the tribes of tokhars who formed a new state - Tokharistan on the territory of Tajikistan. In the 1st century B.C. Tokharistan became a part of the powerful empire of Kushans, and after its disintegration in the 3rd century Sogdiana and Bactria gave themselves over first to Sasanid empire and later to Turkic khanate. Thousands of years ago through these lands there ran the Lazurite road, along which this valuable stone was delivered from Badakhshan to Persia, Egypt and India. Some sections of the Great Silk Road passed here too. One of the caravan roads led from Kashgar through the Karakorum mountains to Khojent and Penjikent and further to Fergana valley and Samarkand. The other road led through Regar to ancient Termez and Balkh. At the beginning of the 8th century the army of the Arabian caliph under the leadership of Kuteyba ibn Muslim conquered Sogd. Arabs eradicated Zoroastrianism and Buddhism, common among the local population, and made Islam the state religion, whereas the Sogdian language was superseded by the Dari language. Some monuments of history and culture of pre-Islamic Tajikistan have remained intact over the centuries. In the vicinity of Ura-Tube, which one of the ancient cities of Central Asia, one can see the ruins of Zoroastrian temple Ak-Tepa, while at the site of ancient settlement Ajina-Tepe there have preserved the remains of seventh-century Buddhist monasteries. In 1933 ancient documents written in the Sogdian language were discovered among the ruins of a castle on Mug Mountain in three kilometers from Khayrabad village. In Penjikent, in the middle of the last century, archeologists discovered a complex of palace and temple constructions relating to the 7th - early 8th centuries. On the walls of the buildings there remained intact the unique wall-painting representing the scenes of feasts of Sogdian aristocracy, mythological images relating to the cult of legendary Siyavush and legends about Rustam - the hero of national Shakh-na'me epic poetry. In the 9th century Tajikistan became the part of Takhirid state, and four centuries later it suffered the invasion of Ghengiz-khan. In the 14th century it became the part of Temur's empire. At the beginning of the 19th century the territory of Tajikistan was divided between Bukhara emirate and Kokand khanate, and after several decades of years Tajikistan was annexed to the Russian Empire. In 1924, after October revolution and civil war in Russia, there was formed Tajik Autonomous republic, which in 1929 became Tajik Soviet Socialist Republic under the USSR. The independence of the country was proclaimed in September 1991. Many ancient cities and monuments of Islamic architecture have preserved in Tajikistan. The mausoleum of Mukhammad Bashoro, built in the 11th century, is located 20 kilometres away from Penjikent. In Khojent which is believed to be built by Alexander the Great, in the 11th century there lived sheikh Muslikhiddin. In 1394, by instruction of Amir Temur, a mausoleum above the grave of this holy man was erected, with a madrassah and a cathedral mosque nearby. The Gissar valley is rich in historical monuments. Among them there are madrassah and mausoleum of Makhdumi A'zam, mosque Sanghin and Gissar fortress built in the 16th century. The capital of Tajikistan - Dushanbe was formed in 1924 as a result of amalgamation of three kishlaks (villages) and within less than a hundred years it turned into modern comfortable city with population of half a million people. Today in the city there are eight higher educational establishments, including the university, five theatres, five museums, philharmonic society, film studio and the circus. The topography of the country impacts all spheres of activity of people. They say the Pamirs is the Roof of the World. Tajikistan is the country of the highest mountains in Central Asian region, the deepest canyons, and the most powerful glaciers. Here people settle down and engage in mountain agriculture at the altitudes which in other parts of Central Asia are far from being habitable. The Pamiri Tajiks joke that they reside closest to the heaven. Natural conditions are severe here. And whereas in fertile valleys the population successfully cultivates grapes and fine-fibre cotton, the residents of mountain villages grow fast-ripening varieties of rye, barley, peas on infrequent mountain strips, so called "dashta", suitable for agriculture. The soil to "dashta" is delivered in baskets. Here, on small shreds of pastures, thousand of yaks are grazed. They are unpretentious, "frost-resistant", and can live in the open air all the year round. The Pamirs is the majestic center of glacier expansion. More than a thousand glaciers occupy the area of eight thousand square kilometers. The most known of them, with the length of 77 kilometers, was named after Russian scientist and explorer Fedchenko. Glaciers and rivers which they feed may become an inexhaustible source for development of the country. 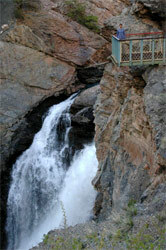 Tajikistan ranks first among the countries of the region with respect to its reserves of water resources. The pride of Tajikistan is Nurek hydroelectric power station which has constrained the wild Vakhsh river and is able to produce 2.7 million of kilowatts. Subsequent to it is even more powerful Rogun hydroelectric power station, which is the most powerful hydroelectric power station in Central Asia. 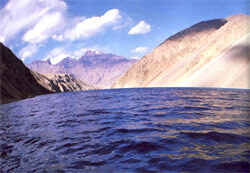 Lakes show blue among mountains. The most remarkable of them is the Karakul ("Black lake") located at the altitude of about four thousand meters above sea level - higher than the well-known Lake Titicaca in the Andes. But, perhaps, among natural sights of Tajikistan the first place is taken by Sarez Lake. In 1911, as a result of an earthquake, six billion tons of stones crashed down into the Murgab Valley. In front of this natural dam of hundreds of meters in height there had begun accumulating a lake, which in three years swallowed up a narrow valley over a 70 kilometers stretch. Ten years later the water level of the lake stabilized on the mark of 3239 meters. Sarez Lake, together with the blockage which it was caused by, is a rare monument of a global scale geological catastrophe ever witnessed by a man. And each traveler, who is lucky to reach the lake by mountain road or by helicopter, is fascinated by its grandeur and beauty. 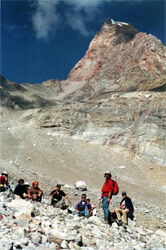 In one of the Pamirs canyons there is a "ruby mountain" Kukhi-Lal. In the old times rubies were called "Lal", which now are mined with the help of modern mechanisms. The famous deposits of "divine stone" - lazurite are located in the valley of Shakhdari. The extracted blue spar is mined at the altitude of 5000 metres above sea level and is transported by helicopters. The city of Khorog, buried in verdure of poplar trees and located at the altitude of 2200 meters above sea level, is the centre of Gorno-Badakhshan autonomous region. A hundred metres up the mountains there lies the high-level botanical garden. Khorog is connected with Dushanbe by the Pamir highway which repeats ancient caravan route. Once it took travelers up to forty days to cover this distance, whereas today the plane route enables to reduce the time of the travel to forty five minutes. Indeed, such a flight is full of thrilling sensations as the crew has to repeat whimsical curves of canyons, especially before landing in Khorog. The highway too has a rather complicated topographical profile: there are eleven passes, breath-taking serpentine road sections and cornices. So, one can unintentionally recollect ancient inscriptions on the rocks "Wayfarer, be cautious! You are here as a tear on an eyelash".